I love anything that saves me money, replaces bad oils with healthy ones, has less calories, and tastes totally, freaking, awesome! 10 years ago I bought the huge bags of Ore Ida Crinkle Cut French Fries . 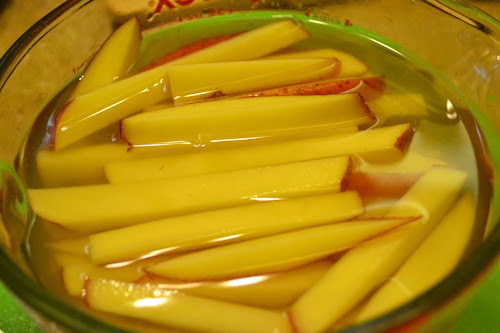 . . Back then I used a deep fryer and canola oil . . . and I didn't know about the health issues attached to canola oil. 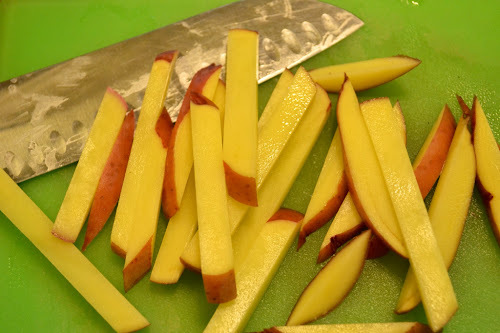 When we decided to limit deep frying foods and began using healthier oils, using Ore Ida Fries didn't work anymore. They were coated in oils we didn't use, were too thick to bake in the oven, and took up a huge amount of freezer space! Nowadays, I stick with pan frying my foods in EVOO (extra virgin olive oil), coconut oil, lard or butter. Today I threw out a big ole can of Crisco (hydrolyzed [transfats] soybean [GMO] oil) hiding in the back of my cupboard . . . just taking up room (It hadn't been used in over 2 years, for obvious reasons!). 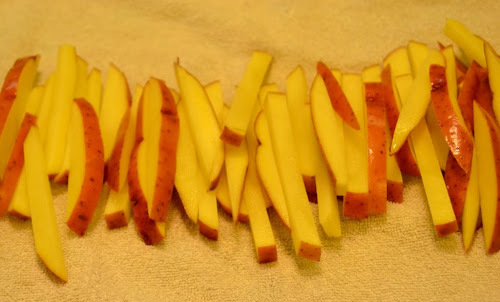 We love French Fries but not all the grease, so I came up with a healthy alternative! 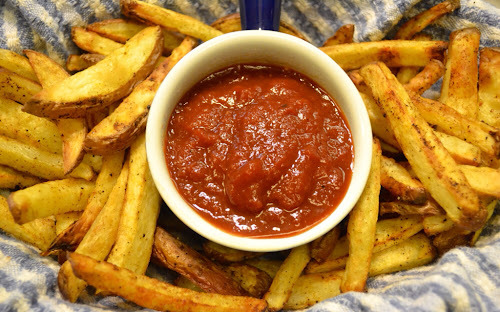 This recipe is so much better than the frozen "you bake" fries in the healthy frozen food section of your local grocery store or specialty markets. Choose medium to large potatoes (1 potato per person; I like to use red potatoes because they're less starchy, but any potato will do). Scrub your potatoes with a stiff vegetable brush (Leave the skin on to retain all the vitamins, and save you from extra work). Next, soak your potatoes in ice water for 10 minutes to remove the starch . . . longer if you have the time. 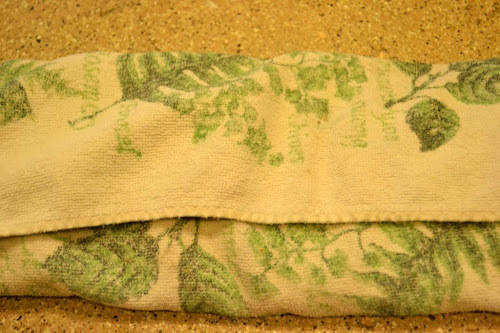 Lay your potatoes out on a clean towel. Fold towel over and pat dry. Arrange potatoes on a parchment-lined baking sheet. 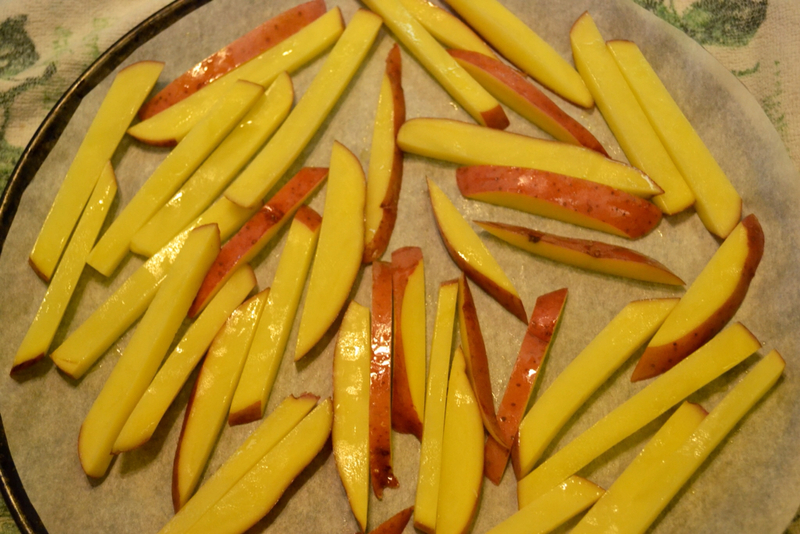 Drizzle with a scant 1/2 tablespoon (1 1/2 teaspoons) EVOO for 3 potatoes. Season with salt, Smokey Seasoned Salt (see recipe below), or a light sprinkling of DIY Creole/Cajun Essence. Bake 12-15 minutes, flip over when the bottoms of potatoes are mottled brown. I bake mine in our large toaster oven, rotating 2 baking sheets between the 2 oven racks, to keep our kitchen cooler and save on our energy bills. Bake an additional 12-15 minutes, until crispy and golden; be sure to do a taste test to make sure they're crispy enough! Serve hot and crispy . . . with ketchup! JULIE'S TIP: If you find you're using the same spices together over and over, make up a large batch, and put it in a handy shaker. 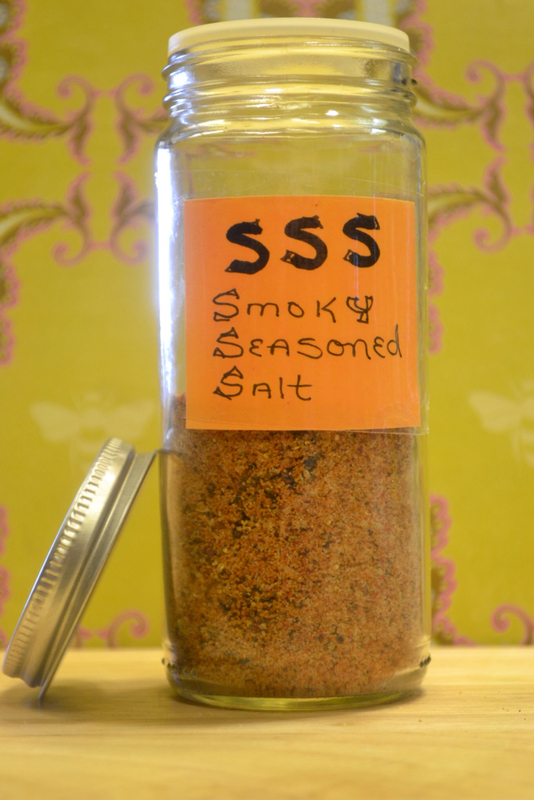 I hope my Smokey Seasoned Salt becomes a regular in your home! It's great on sweet corn! 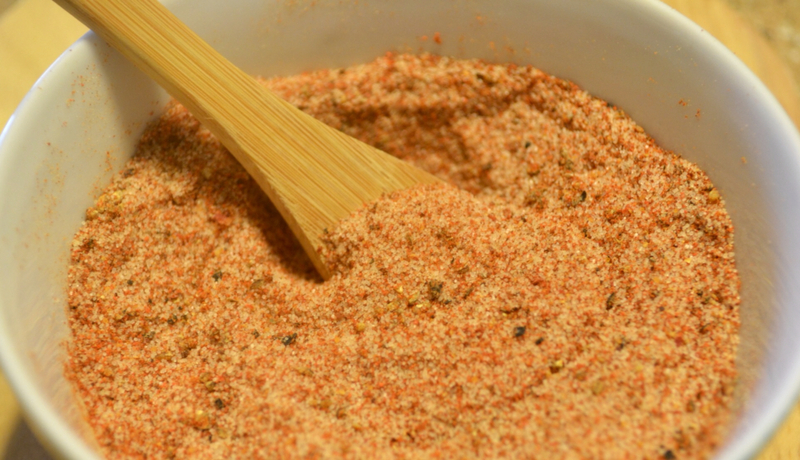 Mix ingredients together and place in a recycled spice bottle. Makes about 1/2 cup of seasoning. This is my take on Penzey's smokey seasoned salt. They also sell a spicer version . . . For that, just add 1/2 teaspoon of cayenne pepper to the above recipe. Baked French Fries with Smoky Seasoned Salt and Homemade Ketchup! You know, this eating healthier thing gets easier as time goes by! Our taste buds have been tricked with hidden sugars, "natural flavorings" and MSG so that we crave foods that are really not good for us! The more I eat truly nutritious foods, ones my body actually needs, and utilizes, I am retraining my taste buds to distinguish and crave those whole grains, juicy fruits, leafy greens and tasty veggies! Just this morning, while straining a batch of my Easy Crock Pot Greek Yogurt . . . As I was slicing up fresh, sweet strawberries to add to the bottom of my yogurt dishes, I realized I was adding more berries than usual, because I knew they were full of vitamin C, antioxidants, and fiber that not only tasted great, but was good for my body! Yup, we have finally taught out bodies, reprogrammed our brains, or taste buds to crave good, nutritious foods! How cool is that? Now instead of potato chips, cookies, or cola, we're craving blueberries, juicy watermelon, green grapes, a fresh green salad, broccoli, cauliflower, spring water with lemon . . . It's exciting to actually desire what's good for us. . . Over at Julie's!!! Keeping it Simple . . . Berries Anyone? Bacon Wrapped Hot Dogs . . . Yummy!